In Japanese, Matsuri means festival. And true enough, it was indeed a small yet a hearty festivity to dine at Matsuri, a Japanese restaurant in Tomas Morato, offering ala carte buffet where you order all you can and eat all you can. It was a very fitting occasion last Friday as I invited my date to celebrate his successful triumph over the hardest 5-year academic endeavor he's been into. And since both of us love Japanese food, Matsuri was the perfect spot for a "feastive" celebration. 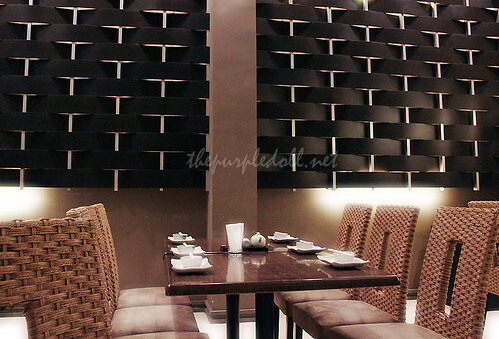 The restaurant's interior boasts of its cozy yet classy ambiance over a romantic dim lighting, although most of the tables are for big groups. The walls and chairs also have an interesting woven detail giving off a down-to-earth, homey atmosphere that goes well with their brown and black color scheme. We felt very welcome upon entering, especially with almost, if not all the waiters were attending to us. (This is why it's nice to eat out before the dinner rush hour.) They handed us a menu with a more limited selection when we hinted to avail the eat-all-you-can which offers choices of sashimi, sushi, makimono, salad, nimono, teppanyaki, robatayaki, tempura and agemono, rice, and desserts. Overwhelmed by the hearty selection of scrumptious Japanese dishes, we just started our dinner date with a plate of assorted makimono. Our server was kind enough to offer us 2 pieces of all their bestselling makimono - Manhattan Panko Roll, Tempura Crunchy Roll, Dynamite Roll, Futomaki, Aspara Kani Maki and Philadelphia Roll. Matsuri's makimono selection were good, but nothing extraordinary. We especially enjoyed their Manhattan Panko Roll as it has crunchy panko bread crumbs and tasty Japanese mayo. Along with the assorted makimono plate, we also got a few selection of sashimi -- our all-time favorite Salmon, some slices of Maguro, and plates of Sweet Soy Tuna sashimi and Spicy Tuna sashimi. 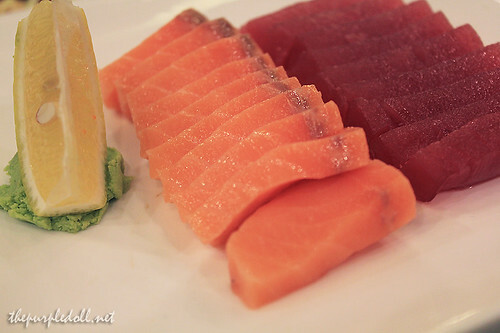 The slices of Salmon sashimi are heavenly -- very clean, silky and buttery sweet. It was indeed a superior grade Norweigan Salmon as they claim. However, it was the opposite for their Maguro sashimi. 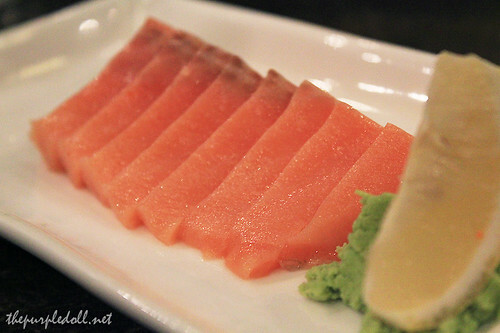 As tasty as the Salmon sashimi was, its tuna counterpart was flavorless and fishy. The Sweet Soy Tuna sashimi was slightly better. Although it still used that same flavorless Maguro slices, it was saved by the sweet soy sauce and interesting crunchy taste of roe. 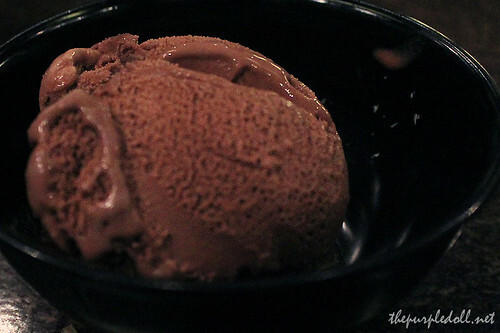 However since I'm not a big fan of sweet dishes, I found this somewhat nakaka-umay. 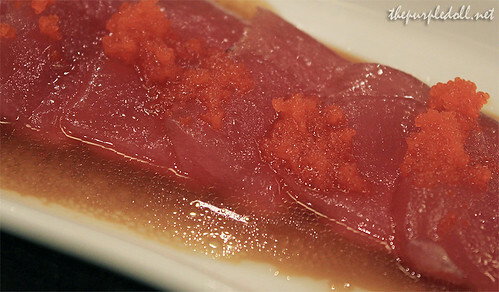 Matsuri's Spicy Tuna sashimi was also a similar story. The flavorless Maguro slices were coated with a spicy marinade and topped with crispy Tempura crumbs which made the whole plate acceptable. It was just a tad spicy for me though. 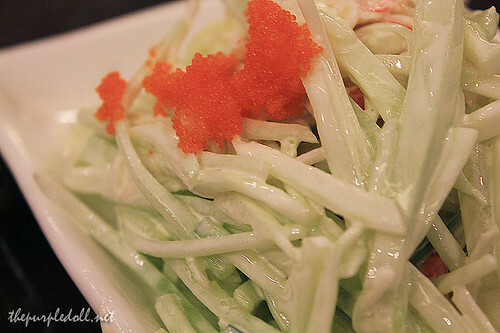 We also ordered their Kani Salad, a Japanese salad made of cucumber strips, crab sticks and mayo, topped with roe. Initially, we thought that Matsuri's Kani Salad was a rip-off because we can't see the crab sticks. But after delving into the plate, the crab sticks were just sitting at the bottom of the generous pile of cucumber strips. Overall the salad was refreshing and tasty, and made even more interesting because of the roe. We never skip Miso Soup when dining at a Japanese restaurant, so we each asked for a bowl. 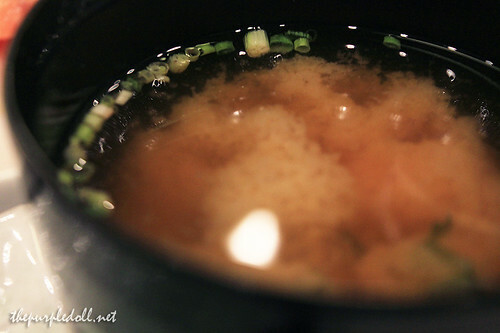 Their Miso Soup is okay -- nothing extraordinary, but still very satisfying. The miso flavor is quite subtle than I would've wanted, but the dashi taste is not overpowering which is good. The tofu in the soup was soft, and there was a generous amount of Wakame seaweeds that I love. 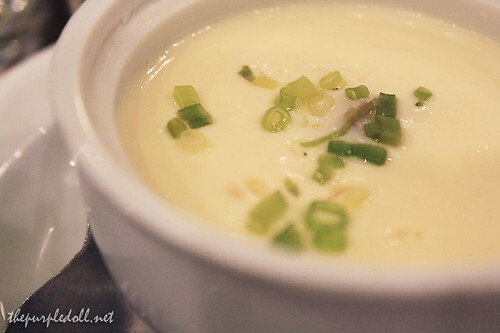 My date and I also shared a small bowl of Chawanmushi, a Japanese egg custard dish eaten as an appetizer. Although I haven't eaten a lot of Chawanmushi in my life, I think Matsuri's version was quite good. The custard was soft and has a delicate crab meat taste. Hidden beneath the soft custard layer are lovely treasures of mushroom and seafood. My date, on the other hand, didn't like this as much as I did. He preferred the Chawanmushi we had at Vikings for its more savory taste. Being big Salmon sashimi lovers, we got a second and even a third plate of these heavenly fish slices. We could eat only Salmon sashimi for our whole stay at Matsuri. We are that in love with Salmon! This is a good way too to make our stay super sulit, since an ala carte order of Salmon sashimi in Japanese restaurants would usually cost P200+ per 6 to 8 pieces. 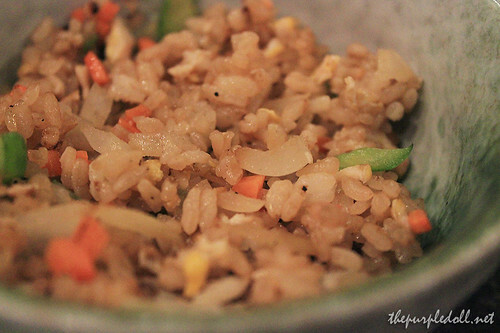 Eager to try their Teppanyaki selection, we asked our server to give us their bestsellers. First to arrive on our table is their Fish Teppan. I'm not sure what kind of fish they used for this since I'm not a big fan of cooked fish. (I like my fish raw!) However, it was quite okay. The flavor is rich, but the fish meat is a little overcooked draining the fish of its moisture. We also had their Beef Teppan as recommended by our server. 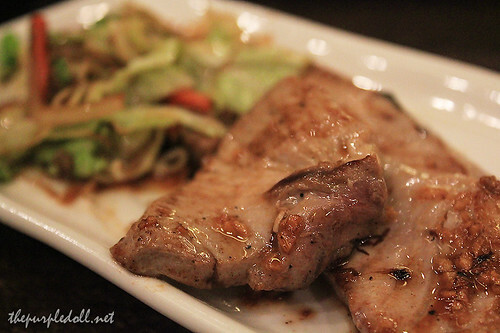 My date liked this dish -- juicy beef cutlets grilled with a sweet teriyaki sauce. However, it was a little unpleasant for me. I like how the beef is not hard to chew and cooked just right, but the sweet sauce threw me off. 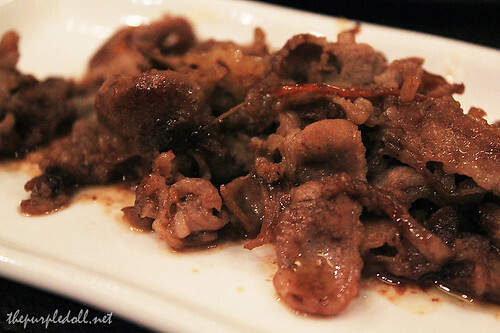 It reminded me of Tokyo Tokyo's Beef Misono and Teriyaki Boy's Gyu Yakiniku, many people's favorites but not mine. We were also served their Creamy Chicken Mushroom Ragout. I didn't expect this plate to be drizzled with a brown sauce since I have always associated "creamy" with real white cream. However, this dish was so good! 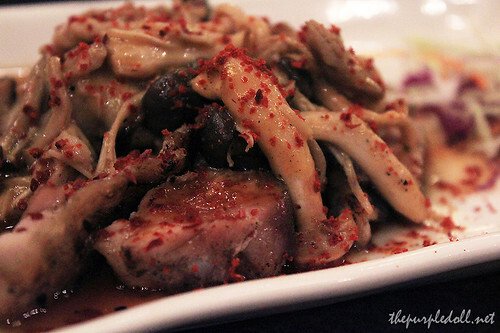 The chicken was tender and moist, while the assorted mushrooms are the superstars. It was slightly crunchy (courtesy of the mushrooms), spicy, sour and savory -- everything I like mixed down in one flavorful plate. The Creamy Chicken Mushroom Ragout was a little strong on its own though, but paired with a small serving of Chahan Moriawase, it became more phenomenal. To maximize our money's worth, we also ordered Matsuri's Ebi Tempura. 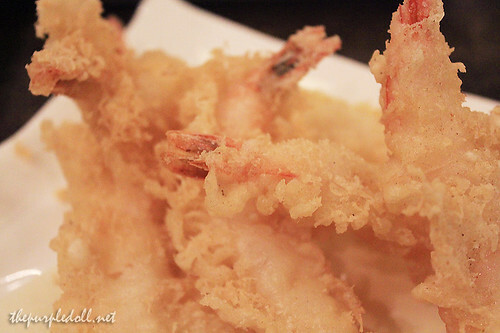 As how Japanese restaurants do, the tempura batter was crunchy and the shrimp was fresh, even beautifully complemented by their sweet garlicky tempura sauce. I wish the shrimp they used were bigger though. But nonetheless, it was good. 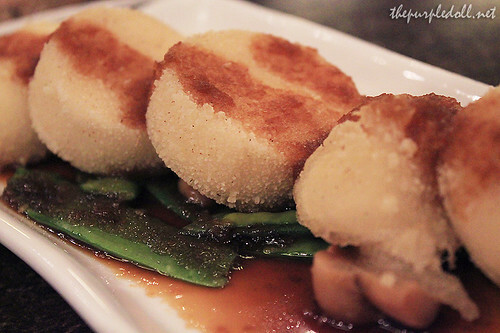 We also got an order of their Tofu Steak, lightly battered Japanese tofu with vegetables in Matsuri's special sauce. I'm not a big fan of tofu, except for those mixed in Miso Soup. However, it was interesting to eat tofu with a slightly crispy batter. The special sauce was good too. The only thing I didn't like was the rough texture of the tofu. I'm not sure if this is how it's supposed to be, but it didn't click for me. 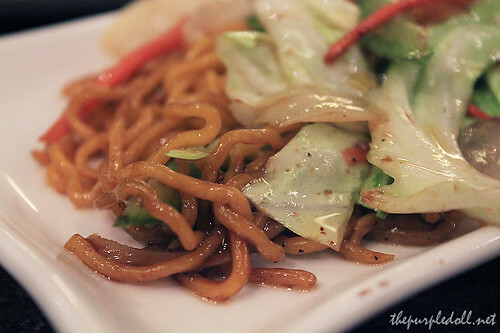 My date loves noodles, so we tried Matsuri's version of Yakisoba. 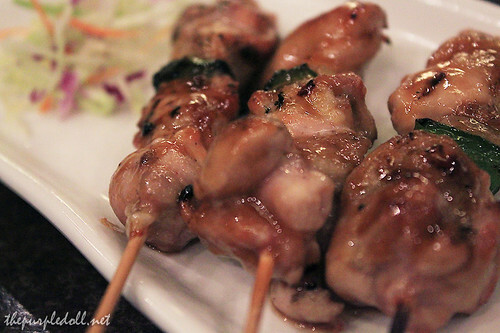 Already feeling stuffed, we still ordered a plate of their Yakitori Teriyaki, chicken skewers with teriyaki sauce. These chicken skewers were so delicious! The chicken meat was moist, flavorful and grilled to perfection. One of the skewers was a little burnt at the top, but I still like it. It adds a somewhat bitter taste to the sweet teriyaki flavor. And to end our "feastive" dinner, we ordered for all of their desserts. However much to our dismay, only the fresh fruits and ice cream were available. It was a little disappointing since I was really looking forward to try their Muscovado and Vanilla Bean Crème Brûlée. 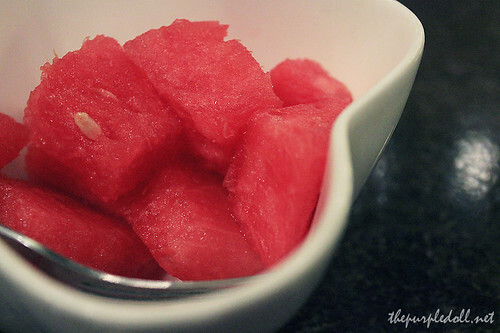 In the end, we settled for a bowl of Watermelon slices and Chocolate ice cream. Being Japanese food lovers, we found our stay at Matsuri satisfying and sulit. We love most of their dishes, and for an eat-all-you-can dinner, it was pretty impressive. The ala carte style eat-all-you-can concept is nice too as you are sure that the food is prepared and served fresh. No Sterno buffet heaters. No rude buffet diners touching all the food. The servers are very polite and alert too. Although in the middle of our dinner, it became a little difficult to call a server's attention since the whole place was already full of hungry diners. 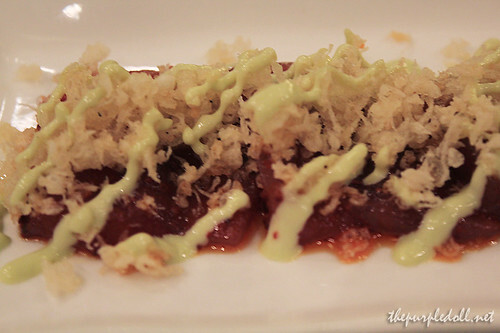 My date and I will surely be back at Matsuri to try other dishes on their menu. We might even bring our families for a Japanese feast. I hope that on our next visit though, they wouldn't be running out of the Muscovado and Vanilla Bean Crème Brûlée. Pano nagkakasya sa tummy mo yung dami niyong inoorder? Win! @Iamadie: It's been there for quite a while na, last year pa ata. Nasa corner siya ng Tomas Morato and E. Lopez Jr. :) kahilera siya ng Il Terrazo. @crumpylicious blog: Checked your blog entry! ;) Let's go back to Matsuri soon. oh la la...the price is not bad after all...gosh, the ambiance is stunning...the food looks fresh and very inviting...nakakagutom...hehhehe! Eat all you can for 595 for a Japanese cuisine? Plus the salmon sashimi, oh my gahd, even the name itself teases me.. I'm definitely going thar! Yah, all that for just two person? ?how'd you stuffed all that in your tummy??? Hello Sumi! Another set of mouth-watering photos. How do you manage your weight trying all these stuff? How I wish I can stomach raw fish, so I'd be like you able to try all these Japanese restos in the metro. Your shots btw are looking delectable. Keep them coming. i am not a fan of japanese foods but the photos you have here make me realize that i have to taste every single dish in this menu to satisfy my taste buds. 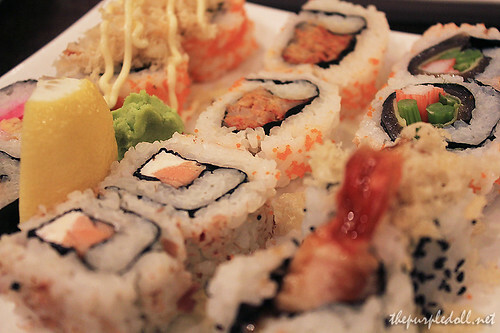 You can never have too much Japanese food. hahaha. It's my all time fave! The Purple Doll's 1st Month!